So! Do you like oranges? I think in India the second most sold flavor in any food item is orange after chocolate! Orange cream biscuits, marie biscuits (remember?! ), ice candy and well, the list goes on! 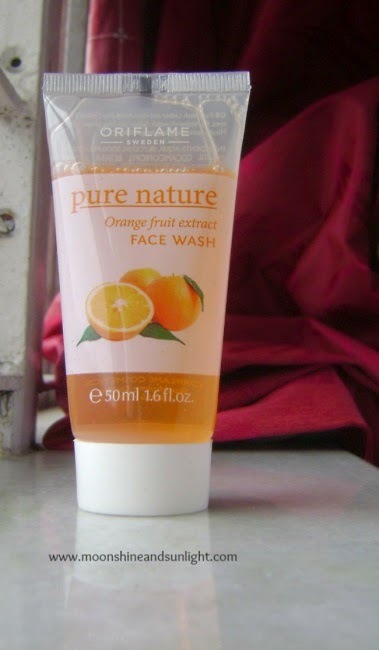 If you like the fragrance of oranges then you will surely like this face wash from Oriflame! I am talking about the new face wash range of pure nature from Oriflame. I have already reviewed the strawberry variant here, and today I have the orange variant! Packaging: - the small tube has a white screw cap and a small hole for the face wash to come out. It comes in a cute tube with the details printed on it. No stickers! I like when face wash tubes do not have stickers. But I would not suggest carrying this for traveling though it is very small in size and would fit into a purse. Product: - the face wash is a very runny liquid and you need a good amount of it to spread nicely. It is orange in color, though on your hand the color won’t show up. The fragrance is FABULOUS! It feels as if fresh orange zest has been added to the face wash! Does not foam up and works a nice lather, Washes out easily. My experience: - Now comes the disappointing part. I love the fragrance but not the long term effect this has. I did not have break outs but, somehow after using it for sometime my skin began to get a bit dull. The citrus, fresh fragrance is very relaxing and does not stay after you have washed the lather off. Just after washing the skin feels fresh and does not feel tight or dry. Since it started making my face dull I wanted to finish it off. And after I am done with this tube I won’t get it. I would not recommend this variant. But you can try this one out. Have you tried this face wash from Oriflame? Do like it? *the product was provided for review. Review honest as always. That doesn't sounds good at all...The after effects are just not expected! Thanks for putting this up babe...Definitely skipping it! Well, I'm using this facewash and finding it pretty perfect for my oily skin. And I would say It is the best product for you, if you have oily skin. It removes extra oil and impurities, and makes your skin extremely smooth easily. This product gives good results rather than medicated face washes because of it has natural fruit extracts.